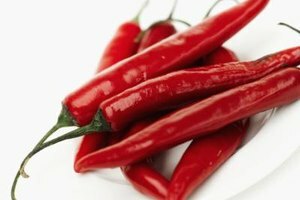 Sweetened chilies bring pungent accents to a wealth of mild-flavored foods. Sweet chili sauce seems like a culinary paradox. Except for a mouthful of cinnamon Red Hots, a swig of ginger beer or a spoonful of holiday pepper jelly, your palate is most likely tuned into hot flavors with salty or tangy accompaniments. Sweet chili sauce, in both Asian and Western versions, lets you use the sweet-hot contradiction to enliven many mildly flavored foods. Start with classic pairings, and then innovate on your own. Increased interest in Asian cuisines has brought the sweet chili sauce originating in Thailand to American markets. The sauce is made from red chili peppers, most often Thai, Fresno or red jalapenos, cooked with water, sugar, rice wine vinegar and sometimes garlic or a dash of Asian fish sauce. The heat of the sauce is determined both by the kind of pepper and the number of seeds included in the sauce. Cornstarch serves as a thickener, and the sauce may be pink to red, depending on its pepper content. Pungent Sriracha chili sauce adds strong tones of garlic and Asian fish sauce, along with some tomato flavor, to a hot yet sweet Thai pepper base. Asian sweet chili sauce is easy to make at home or can be bought at supermarkets. A traditional American relish provides an easy way to preserve summer garden surplus and brighten winter dinners. Sugar, vinegar tomatoes, peppers, onions and ground spices add to the zing of sweet and hot peppers. Because it is so often served with shellfish, commercial brands of tomato-based sweet chili sauce are often labeled "cocktail sauce." Although the ultimate flavors differ somewhat, Asian and American sweet chili sauces both bring bright accents to mild-flavored meats. Use sweet chili sauce to glaze a pork loin or tenderloin roast, a roasting chicken or baked chicken parts. Chili sauce is particularly effective at brightening up the taste of turkey or chicken burgers. Add a bit to the pan during the final minutes of cooking for a quick glaze, or spread chili sauce on burger buns. Offer it as a garnish for cold cuts or sliced cold beef or pork roast. Some American diners envision shrimp solely as a chilled cocktail topped with a spoonful of sweet tomato chili sauce. Both Eastern and Western sauces provide great foils for the delicate and sometimes bland flavors of fish and seafood. Top filets to be baked with a spoonful of chili sauce, or offer it as a dipping sauce for fried or oven-baked seafood, from fish filets to calamari rings and oysters. Vary shrimp scampi with shrimp Thai chili. American chili sauce combines with mayonnaise to form the foundation of traditional Crab Louie dressing. Consider mixing Thai sweet chili sauce with mayo, sour cream or yogurt to create an Asian Louie dressing for seafood salads. The bright accents of sweet chili sauce both brighten and enhance the creamy blandness of dairy and egg dishes. Greet unexpected company with an instant hors d'oeuvre of sweet chili sauce over a block or tub of cream cheese, surrounded by crackers. Crackers and more strongly flavored cheeses like Brie and Cheddar pair well with the piquancy of chili sauce. Add a dab of sweet chili to a plate of scrambled eggs and potatoes, or spoon a thin line over an omelet.